This has been an amazing past few days! 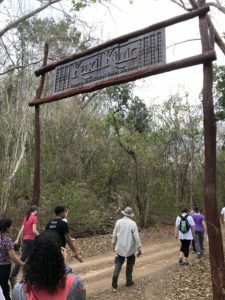 After a quick visit to Maní to see a traditional Mexican Sunday mass, we were off to La Reserva Biocultural de Kaxil Kiuic (pronounced “Kashil Kooeek“). “Kax” in Mayan means forest and “Kiuic” means a place to come together. The inside of the church in Maní during Sunday mass. 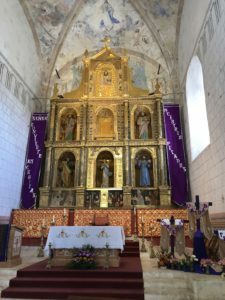 Click to see a traditional Sunday Mass in Maní. Kaxil Kiuic is a nonprofit private reserve created in 2002 by Millsaps College run by Dr. James Callahan. According to its mission statement, its purpose is to “conserve through research and education.” The reserve encompasses 4,500 acres of tropical dry forest and data is collected regarding the forest’s ecology and capacity to sequester carbon dioxide, a very important attribute to fight against climate change. According to the latest experiments, Kaxil Kiuic’s forest stores about 215,000 tons of carbon in the above-ground biomass and in the soil. 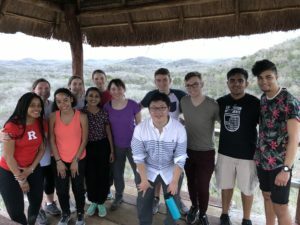 Kaxil Kiuic has a nursery to grow produce-bearing plants and provide them to more than 400 Mayan farmers and 5 private property owners in 5 counties in the region. The plants help to provide support for production in agriculture and biodiversity in the Yucatán. Kaxil Kiuic is important for its biodiversity: 247 bird, 14 amphibian, 52 reptile, and 63 mammal species call Kaxil Kiuic their home. 29.2% of the birds present in the Yucatán Peninsula and 14.3% of birds in Mexico live in Kaxil Kiuic. Also, five of the six large feline species endemic to Mexico, including jaguars, live in Kaxil Kiuic. Kaxil Kiuic is also an archaeological site, where for almost 20 years, archaeologists have been unearthing ruins of the houses, pyramids, and town squares of the early inhabitants this region. It is located in the Puuc region (“Puuc” is Mayan for hills). Millions of years ago, this region was covered by an ocean. As the creatures that lived in this ocean died, their skeletons and shells fell to the ocean floor. Their remains were compressed over time and formed limestone. These layers of marine organisms formed another sedimentary rock called dolomite. As the continents shifted, the ocean bottom and these deposits of limestone and dolomite were lifted out of the water and exist where they do today. Rainwater mixes with other acids in the soil creating a weak carbonic acid that reacts with the calcium in limestone and dolomite, slowly dissolving the rock. As the water travels through breaks in the bedrock, cracks widen to form underground passages and caves. This can explain the existence of cenotes in the Yucatán! At the top of the tower of Kaxil Kiuic. You can see the limestone and dolomite hills behind us! 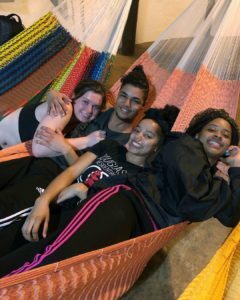 We slept like natives in hammocks! After our night in Kaxil Kiuic, we had breakfast and said our farewells to Dr. Callahan. Us with Dr. Callahan before leaving! 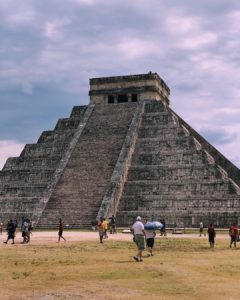 We traveled to Chichen Itzá (pronounced “Chee chen eetza“) which means place of the sacred mouth in Mayan. That “sacred mouth” is the nearby cenote, which the Mayans considered the portal to the underworld, where the gods existed. The Mayans threw all kinds of offerendas and sacrifices into the cenote, including pottery, idols, headdresses, human remains, and food. After extensive archaeological research, it was also found that a cenote exists under the great pyramid of Chichen Itzá. Me with Chichen Itzá in the back! 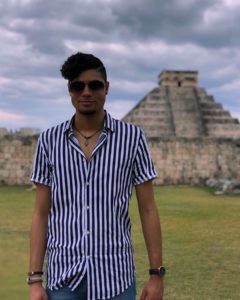 The pyramid is an architectural marvel that depicts the Mayan calendar: on each of the four faces there are 91 steps (91 times 4 = 364) and on the very top, there is one extra step (representing the number of days in a year — 365). One face of Chichen Itzá. 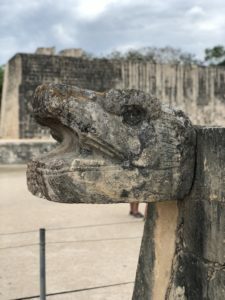 Also, during the spring and fall equinoxes, the shadows created by the pyramid at sunset cast a serpent figure on the pyramid, representing the feathered serpent god Kʼukʼulkan (pronounced “Kuukuul Kaan“) who brings with him rebirth and life. To think that the Mayans could create a structure so extraordinary and meaningful without the use of modern technology was absolutely incredible. After our visit to Chichen Itzá, we jumped into a cenote. (No, we weren’t being sacrificed!) The water was fresh, perfectly clear, and bottomless. These experiences have been great and I can’t wait to see what comes next! 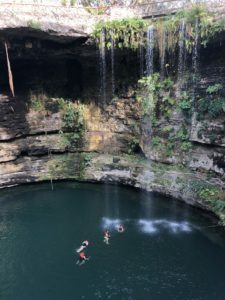 Click to see me jumping into the cenote! Kaxil Kiuic is a fascinating place! So interesting it’s mission, biodiversity, archeological and geological facets. 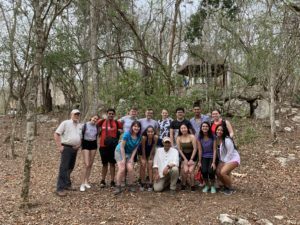 Great that Dr. Callahan invited your group to explore and stay in this biocultural reserve! Must have felt strange to sleep in a hammock all night 😁 definitely a first. Love the video of you jumping into the cenote! Glad you are learning and having fun! Chichen Itza is amazing we went in 1984 you could climb to the top scary coming down. Cenotes are so cool glad you got to experience it. Great job of writing, Jeremy.